A football tournament to mark the 29th anniversary of the Bradford City football stadium fire, which killed 56 people, has taken place this weekend. The fire broke out during a match between Bradford and Lincoln at the Valley Parade stadium on 11 May 1985. Teams from Bradford, Lincoln and Hamm, in Germany, which is twinned with Bradford, took part. The tournament was held at the Marley Activities and Coaching Centre, in Keighley, on Saturday and Sunday. 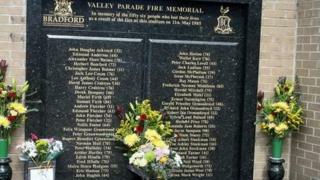 Organiser Carl Dalton, who was at Valley Parade on the day of the fire, said: "The tournament helps preserve the memory of those who died. "While the tournament was borne out of a tragedy that will always be remembered, it also gives us a chance to look forward and see young footballers enjoying the tournament. "It shows how sport can unite people."